Luckily it’s an avalanche of interesting things (my favourite kind of avalanche). I WANT ONE!!! This is the first Kinect game that I want. It makes great use of the movement-tracking capabilities of the Kinect AND presents me/us with an opportunity to be creative in a video game. Normally it’s about following the script, competing with friends and enemies (mostly enemies), and completing defined tasks, so the chance to break free of those boundaries is more delicious than a chocolate sundae. In this ambient stunt Nike transforms Dagenham swimming pool into a BMX park. It’s slightly predictable and isn’t really exciting in the sports industry. However, I will always be a fan of making something positive out of the negative – the crisis/opportunity philosophy – and creating an event as a spectacular send-off a local swimming pool is a great gesture. This video deserves a shout for the outstanding animation work (some of the best I’ve ever seen). It’s C Beebies meets Kill Bill and one hell of a video that’s sure to go viral. Junkyard jumbotron allows you to merge together an image and make one big display. I like this idea because it has so much potential. It can be used to create a fragmented message or puzzles and can really engage people if it’s used right. I think it would also make a great medium for some adventurous digital artwork. This is the Mountain Dew Pinball Skatepark in New Zealand. It turns the skateboarder (you) into the pinball. It records your score and lights when youride over elements of it. It’s soooooo awesome! If I become a millionaire (and I’d like to think that’s possible) I’d want one of these in my back garden, next to my recording studio. but none more so than alcohol and gambling. The vice brothers often party together hand-in-hand on a Saturday night as people (mostly men) give in to their dark sides. Heineken have decided to blend the two together, quite literally, by creating a branded mobile game. Star Player allows it users to compete against each other in predicting what’s going to happen next in any match that’s occurring on television. 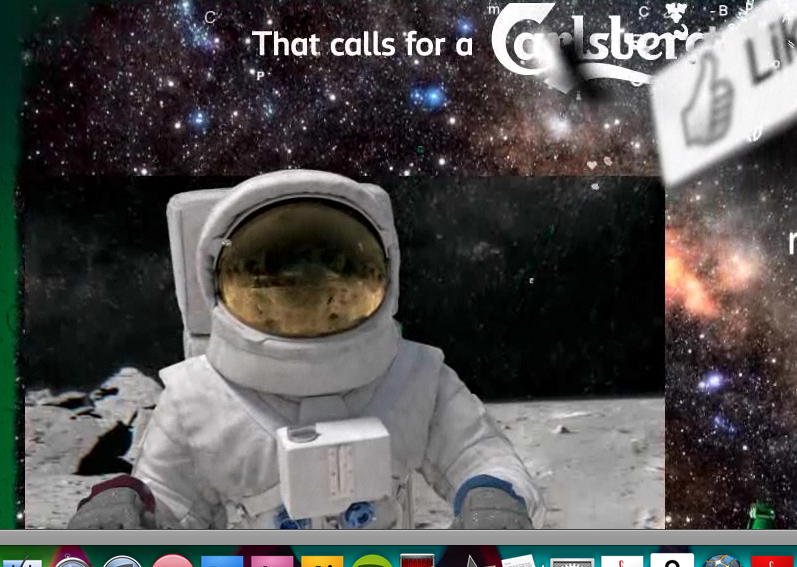 The idea is genius, and a great way of combing social media and entertainment with the brand. What’s more. It actually looks like fun, as opposed a lot of branded games which focus on the branding before enjoyment, with complete disregard for the purpose of the application. With the realisation that men watch most football matches in the pub, and all almost all with friends and some variety of beer, this app acts very similarly to a point of sale advertisement and strongly reinforces the brand values. I can’t wait to try it. Too bad I’ll have to wait until next season. This is a wonderful use of QR codes. They’re more popular than an underwater oxygen store at the moment, but I think this has earns extra points for it’s relevance and ingenuity. I hope this guy got the job because he deserves it for this idea (and I’d prefer not to compete against him for a job). Lately I’ve been playing a lot of hide and seek with digital work (it’s obviously bit of a one-sided game) and my inner ego maniac is convinced that everyone wants me to share it and let them know my thoughts on it. Well, if you insist, I’ll throw a few thoughts your way. 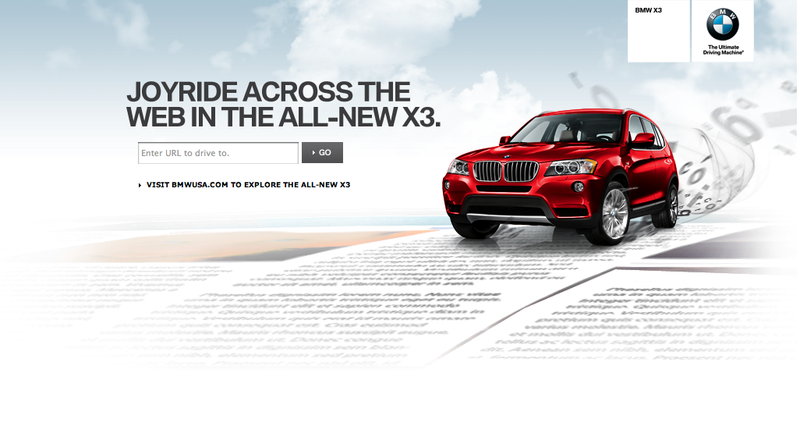 Put a website address into this page by BMW and you can drive around the page, terrorizing banners and destroying text all over the web. It’s actually pretty addictive. There’s something genius about having an interactive extension that you can use on any page. I personally went on a joyride on Porsche’s webpage (well I thought it was funny). I’ve taken a shine to this. It’s my latest love in the world of all things cool and digital. It’s so simple and fun. I know everyone who watches it can’t resist putting their finger on the screen and getting involved in the magical shenanigans. It’s branded entertainment at it’s best and it brings me nothing but pure delight. Another masterpiece from a brand that has a habit of creating amazing stuff. This isn’t really about the technology itself but the application of it. I think it’s a really innovative and fun use of Google to launch the service in Japan, and really puts the imagination of Wieden + Kennedy on display. 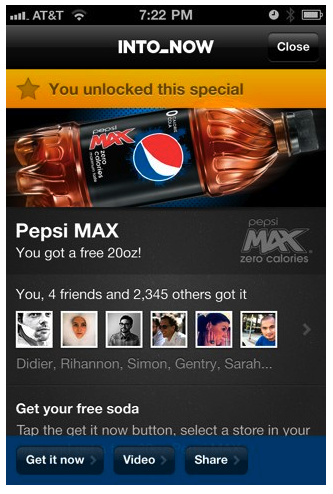 I have some issues with Coke (I’m a human being after all) but this is about the app rather than them. It turns your iPhone into a snow globe. I love this! It’s exactly the simple, festive and interactive app that makes me want an iPhone despite my lack of funds or necessity for one. *Apologies for the video. It was the only one I could find that actually showed what the app is. Google again. This is the direction that technology is heading- all combining to form one single platform. Google Tv combines the internet with Tv allowing you to use both simultaneously. You can search for shows and movies online and then watch them, all on your tv screen. Not sure which movie to watch? Look at the reviews before you start watching. It’s the ultimate technological indulgence that will become standard before we know it. Note to self: It’s all progressing as I planned (Mwah aha ha ha). Next I think it will consume social media and combine that world with media. My personal favourite piece of technology I’ve found, even though it’s only out in Japan at the moment. It’s an iPhone app that combines GPS, motion sensors and augmented reality. The objective is to track, collect and trade virtual butterflies, each of which represents a coupon for a particular store in the area. You have to find a butterfly on the GPS map, mosey on down to it’s location and then, using the camera, ‘catch’ the butterfly in your net. Each butterfly is beautifully designed according to it’s location and it’s one the few ideas recently that combine fun with function, helping to increase retail output in an uncertain Japanese economy. Like iButterfly, Word Lens is an app for iPhone. Using the camera it automatically and instantly translates signs and other information on the screen. How useful is that? I have no real idea how it works but I think it’s a real revelation in communications.